We decided to dig into the waste at the TEA office to find out how we can reduce it. We're a bit embarrassed about the results, but we've resolved to do better. 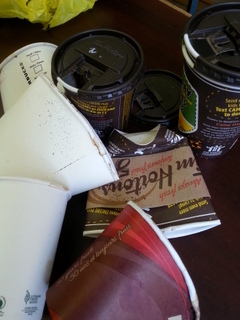 With so many people coming through the office - around 7 full time staff plus 5-10 canvassers who are in the office for an hour each day, plus up to five volunteers and summer students - our office schedule varies, and there are a lot of people who contribute to our garbage! As part of our commitment to the Waste Free Challenge, for #2 - Measure your Waste, we decided to do a full-blown waste analysis! We tore open our garbage and sifted through it to see what's there. So what did we find in TEA's garbage? 25% recyclable materials! This included receipts and take out food containers. 25% compostable stuff! This includes paper towels, tissues & food scraps. 20% plastic packaging that isn't recyclable right now. This includes office supply packaging and snack wrappers. Unfortunately, our office is in a building that has private waste services - so we don't get Green Bins or Blue Bins from the City of Toronto. This means that food waste and paper towels that could go in a green bin at home go in the garbage. The recycling rules are also different in our office, and it's very confusing, especially for visitors to the office who aren't here all the time. We're going to take the rest of the Waste Free Challenges to walk us through the next steps to reduce our waste in a lasting way. The most important part of taking the Challenge is to work together and share the experience. The results of the waste analysis and the current state of waste in the TEA office is being shared with all staff and visitors. *We've already started to deal with our food waste - for Challenge #7, we set up a worm composter last week, and things seem to be going well!